With the exception of the cabin top I just finished round one of longboarding the decks. I'm pretty pleased with the result but will need to do a bunch of spot filling in areas that are a bit low. On the next round I have to address the chainplates since they are a bit raw right now. 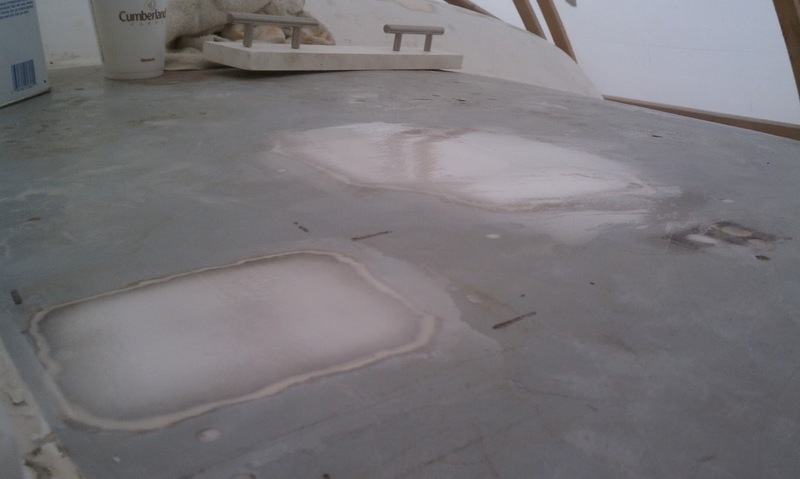 I really like the idea of doing little islands that will raise the chainplate/deck interface to prevent water intrusion, but I'm not sure the extra work is worth the trouble. One area that I was pleasantly surprised was the aft deck. 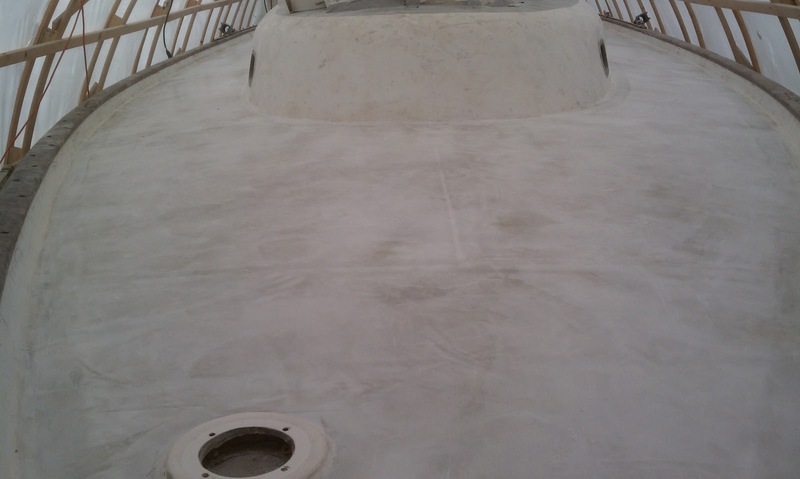 That was where I started with the fairing compound and there are a lot of tight areas to 'spackle' around. But with a little elbow grease and a bunch of corner sanding it turned out ok. Still need to spot fill but I think it's all good. In the meantime I'll have to re-install the chainplates so they are ready for either just cleaning up the interface or raising it up to make little islands. I hope to carve out some time this weekend to spot fill the low areas and keep moving forward. I made myself fairly scarce at work this week and spent 2 afternoons finishing up adding the fairing compound to all the decks. Now the first coat is on the entire boat. 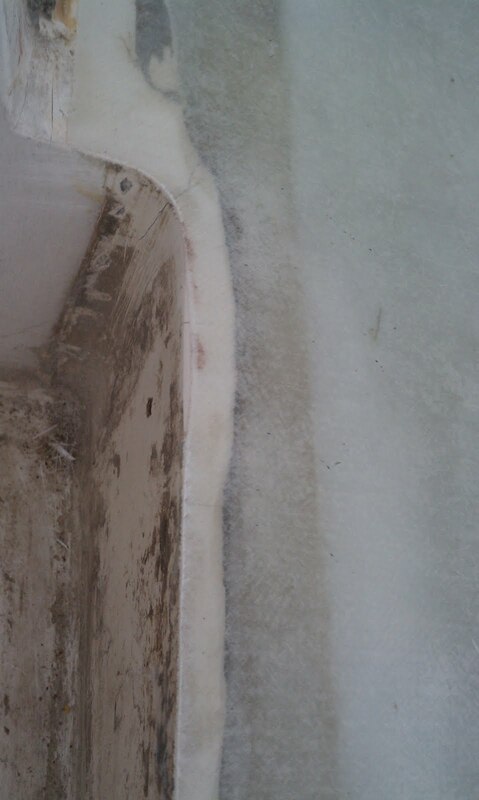 I used just a tad less than a gallon of epoxy mixed to a 2:1 ratio of Q-cells to Aerosil. Some spots are better than others but overall I'm pretty pleased with the results. I certainly will need more in some spots (particularly the cabin top which seems low), but it will be a lot less than the first pass. No surprise but the hard parts were around the chainplates and rear deck scuppers. For a final pass I will re-install the chainplates with a layer of tape around them and fair with them in place. But that's a ways off. I have to say that I'm not sure what people are complaining about. Long (torture) boarding isn't that bad. I find it somewhat soothing. Sure it's slow going, but it sure as hell beats grinding bevels in the decks with the angle grinder. I will not miss that one bit. I may build another longboard that has a little more flex to it to conform to the curved areas on the deck, but the two that I made so far seem to be working well (17" & 11" for tighter areas). 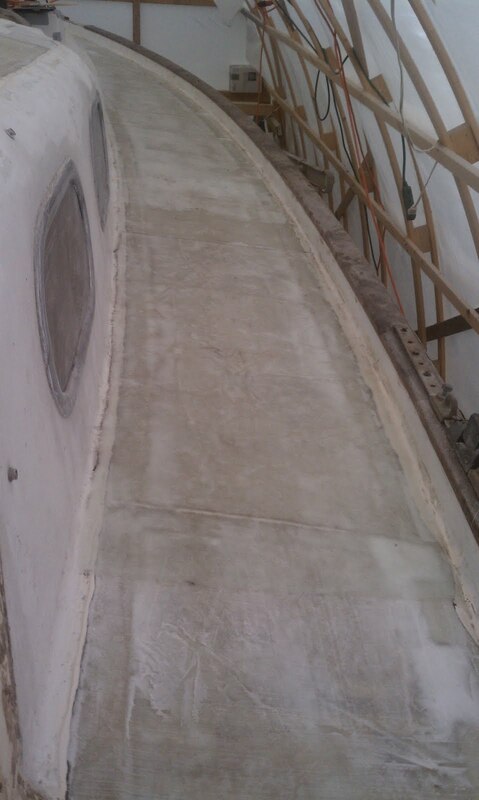 I spent about 2 hours this morning long boarding the foredeck and as expected, there were a few low spots but nothing major and a small amount of additional compound should make it right. 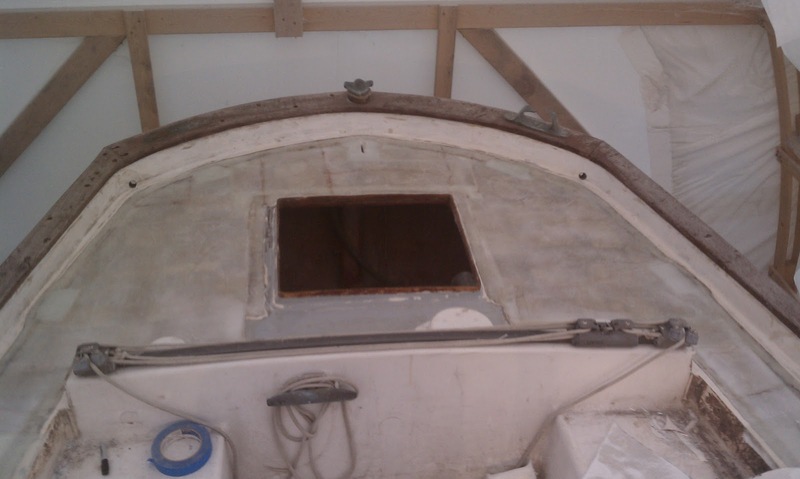 Once I make it around the whole boat with the longboard (maybe another week or so), I'll pull all the ports and start sanding and prepping the cabin trunk sides. 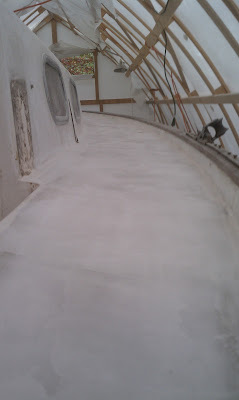 Then a final (hopefully) coat of fairing compound to fill out the low spots and another round of longboarding. At that point things ought to be ready for primer, but depending on weather (temp and humidity), that may have to wait until spring. Hard to see, but the foredeck up to the forward part of the cabin trunk has been longboarded. The darker areas are low spots that will need to be filled again. After a bit of a rocky start trying to lay down fairing compound so I won't have to spend weeks and weeks sanding I think I've finally figured out a technique that works for me. It's not so much technique and comes down to practice to be able to lay out a decent layer of delicious white frosting on the decks. Part of the issue was getting a batch mixed up to the right ratios before it starts to kick without panicking. 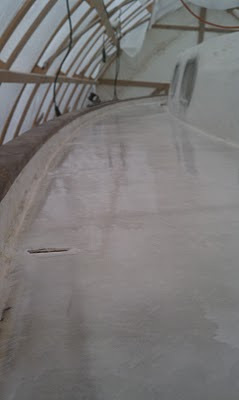 When I did the aft deck I thought I'd plan ahead and mix up the Aerosil and Q-cells together in the proper ratio, but for some reason when I did it that way, the mixture didn't thicken up as it should given how much Aerosil I was adding. I can't be sure, but I think when you mixed the Aerosil with the Q-cells before adding to the epoxy, the Q-cells 'smother' the Aerosil and cause it to lose its thixotropic properties. Whatever the reason, I ended up adding way to much to the epoxy and nearly ruined the batch. So I've gone back to the standard method where I add the Q-cells first to get a creamy texture, followed by the Aerosil to stiffen up the batch so it won't run. I know it's ready to apply when my mouth starts watering because it looks so much like yummy white frosting. I haven't tried it yet, but I'll bet it tastes delicious. 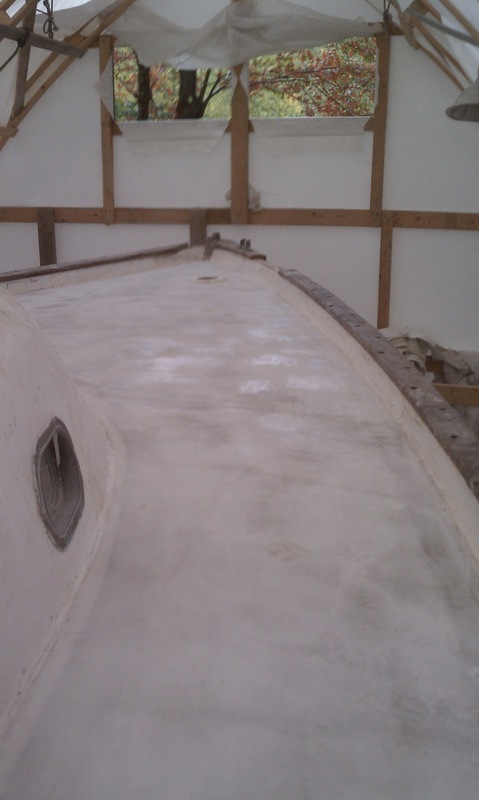 I spent about 3 hours yesterday getting the first coat of fairing compound on the foredeck. Over half the time was spent with the DeWalt random orbit sander and a pile of 60 grit paper. 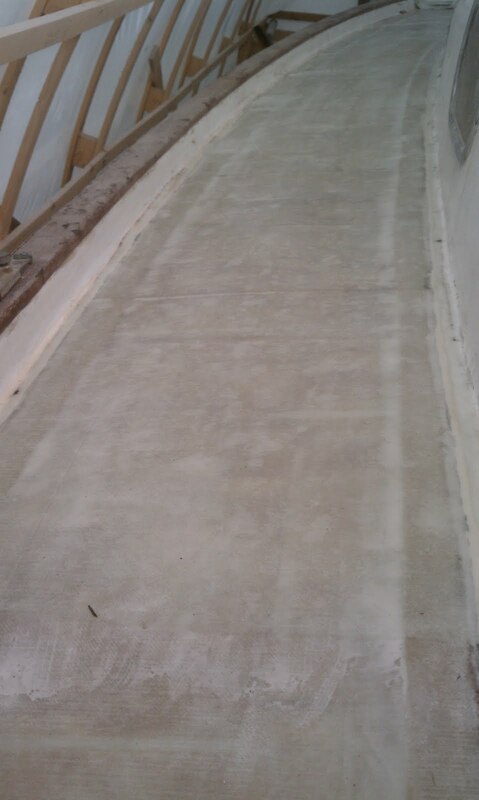 I went over the entire area to knock off any major high spots and to provide a good substrate for the epoxy to adhere to. I also found a few air bubbles along the way that I had to sand/grind out. They were only about the size of a quarter and didn't extend beyond the top layer of glass (of 3 total). 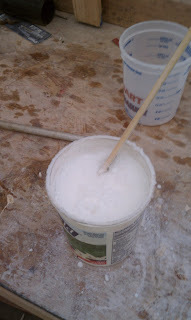 Once sanded, I vacuumed and wiped everything down with acetone before mixing up my first batch. Small areas on forward cabin top were easy. I had to plan ahead a little because of the large area and ended up doing it in 3 batches of 18 oz. I had enough of the third batch left over to put a second (and possibly final) coat on a few of the small sections of the forward cabin top. I am really enjoying this part of the process; it's a nice feeling when you lay down a nice smooth trowel of compound with no ridges or ripples; there isn't a huge pile of grinding dust to make you itch for days; and knowing that each swipe brings me that much closer to finishing this sucka. I stopped back after dinner to check on the layup and spent about 20 minutes longboarding the cabin top that I had done a few days back. 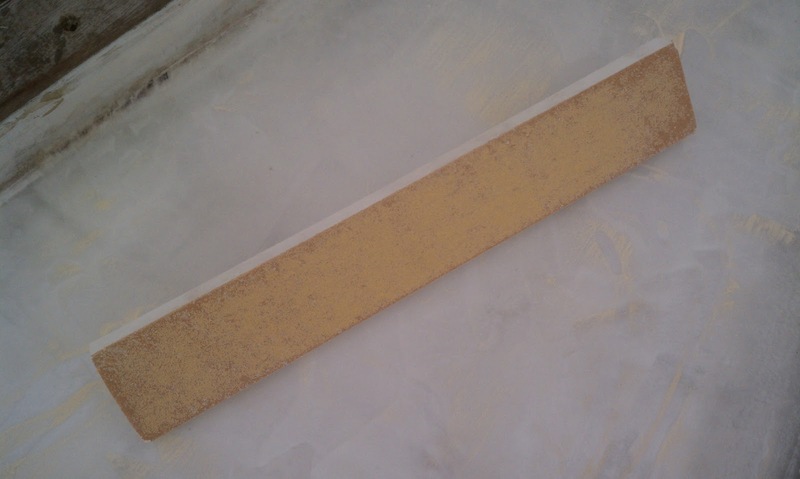 The good news is that the 2:1 Q-cell to Aerosil ratio is nice for sanding; the 60 grit paper cuts right through it and is very satisfying. 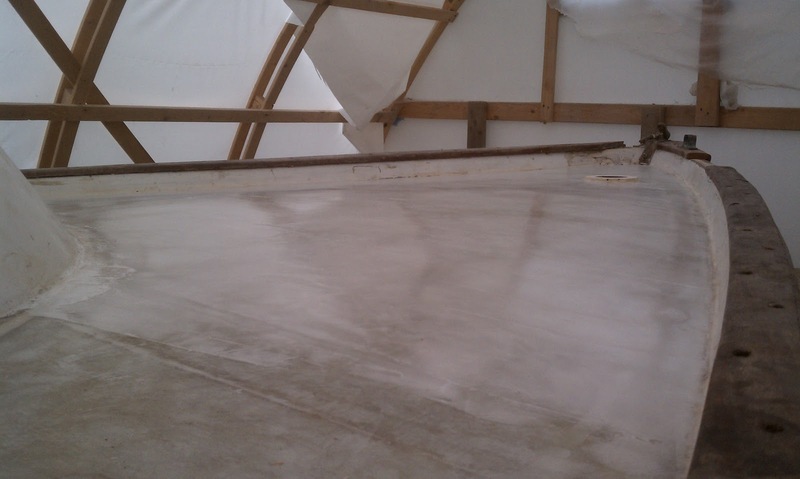 The bad news is that I didn't get the cabintop fair with the first coat of compound. I'll have to do at least one more coat before I'll be happy, but from what I've read, the big areas typically will need several passes before they could be considered fair enough. I'll post some photos of that next time. It's starting to look like a boat again. So it looks like I need some practice with this whole fairing thing. 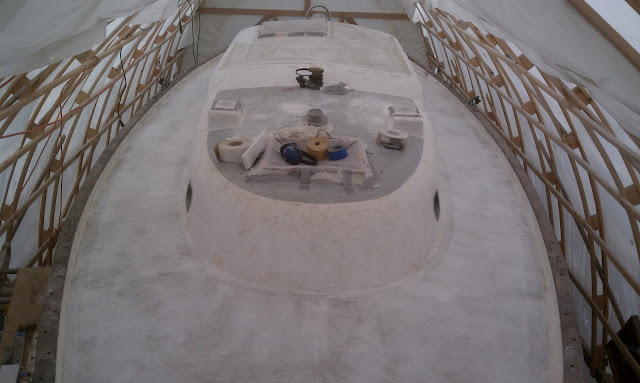 I took advantage of the still green epoxy on the aft deck and decided to get a head start on laying down the fairing compound. I wish I could just spread it all nice and perfect, but it just doesn't seem that easy. I kept dragging an edge or putting too much pressure on the spreader and as a result I couldn't get it perfect. The main tool I was using was a 12" steel edge drywall knife for the open areas and 4" and 1" plastic spreaders for the tight spots. The aft deck was actually not a great place to start because there are lots of complicated edges and corners, but all in all it came out ok for a first pass. To build the long boards I used a few pieces of plastic wood cut into 2-3/4 inch strips; one 17 inches and one 11 inches. 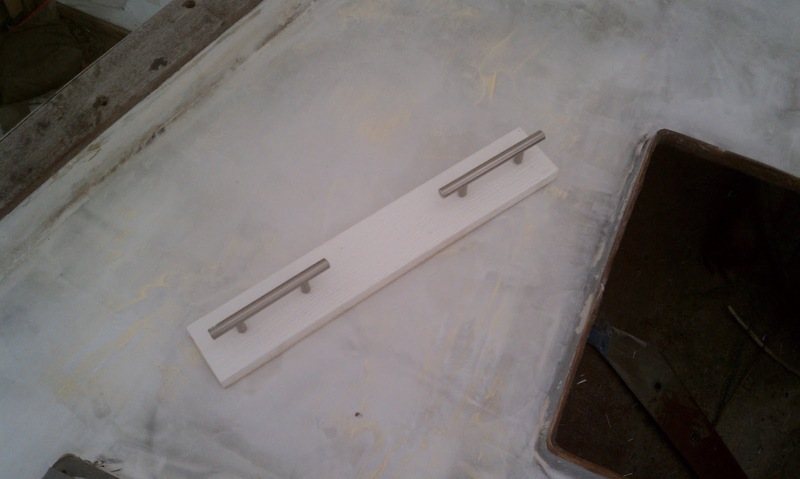 I countersunk screws through the bottom and mounted 2 cheap kitchen drawer handles to the top for a good handhold. I ordered a few 25 yard rolls of pressure sensitive adhesive (psa) long board sandpaper and it showed up on Saturday. The next day I came back and attempted to try out my newly built long boards. Unfortunately, the cold weather the night before had slowed up the cure and I found myself gumming up the board quickly. I was a bit worried because I thought that I may have improperly mixed the last batch and wondered weather or not I would need to grind it all off. Fortunately, when I stopped in this morning I could tell that things had hardened up much better overnight. I decided I would let everything harden up for a few days because the cold is expected to continue throughout the weekend. Not much time left; ideally I'd like to be able to get a coat of primer down before winter, but I don't know if I'll make it before it gets too cold. 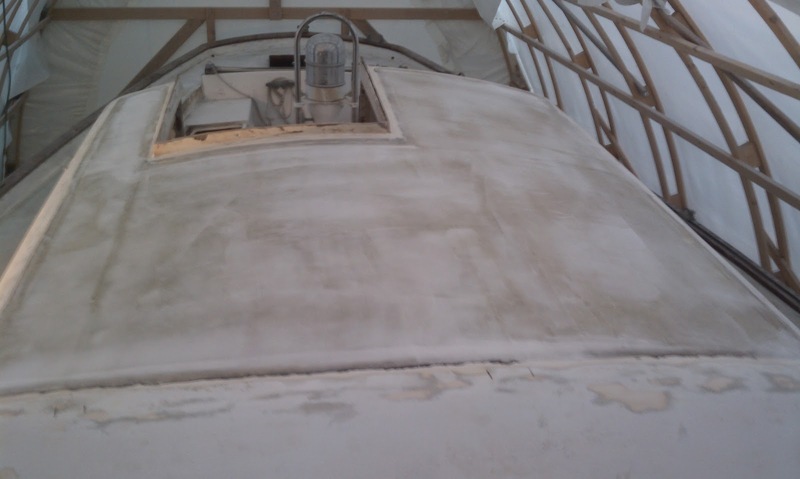 Anyway, I spent a few hours today sanding and prepping the cabin top with the 5" deWalt (the big Rigid is STILL in the shop... grrrrr) and got a first coat of fairing compound down. It was a lot easier on the cabin top because there aren't many quirky corners and edges. For the fairing compound I mixed up 48 oz (in 3 batches) and added roughly a 2:1 mix of glass Q-cells to Aerosil. I probably won't even try any long boarding for a few days because my schedule is pretty busy this week, but it's just as well because the cold will slow the cure down anyway. It was late January 2010 when I first plunged the circular saw into my squishy old decks on Magic, and as of 8pm last night I can finally say that I have finished recoring the decks. Of course the project started long before that first cut, and will continue long after today, but this is a milestone I hope to never achieve again (at least not with Magic). Given the ridiculous schedule our family is on right now with a myriad of school related activities and shuttling all over New Hampshire, I pretty amazed that I've gotten this far without throwing in the towel. Early on in this project I found myself getting overwhelmed with everything that needed (and still needs) to be done, but I found that by just focusing on the task at hand and working that to completion, I could manage and move forward without wanting to cry (at least during the day). A few months back I found a quote from Mark Twain that absolutely floored me and literally gave the project a new lease on life. Simple and obvious, but it has become my mantra. I have thrown away my big list because it's too big, and now just focus on the immediate task and those right after. 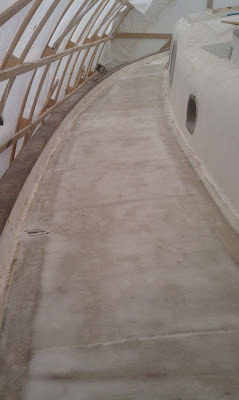 Anyway, here are a few pictures of the aft deck that I completed last night. 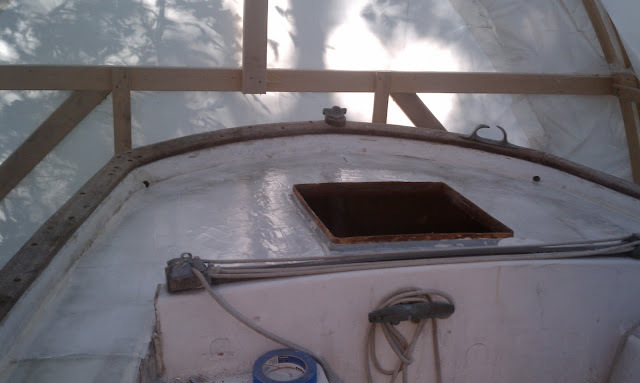 I may jump right into the fairing this afternoon while the aft deck is still green and I can avoid sanding, but that will depend on whether the edges of the glass are flat enough and don't need any cleanup. 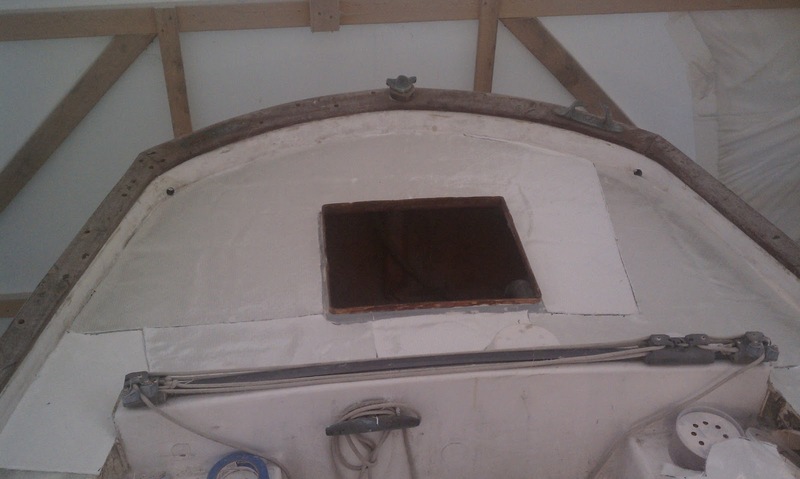 After that, the boat and shed are in dire need of a top to bottom cleaning before I start the bulk of the fairing. Aft deck pre-faired and ready for glass. Glass cut and ready for lamination. Aft deck laminated, bagged, and tucked in for the night. Looks like the first picture above but now has 3 layers of glass. Over the last week I was able to tackle the port sidedeck and the areas adjacent to the cockpit but I found myself rushing just to get it done and as a result, I was a bit sloppy. For the port sidedeck I used my standard technique of pre-fairing followed by sanding and then lamination of the third layer on top of the pre-faired area, but this time I decided to do 3 adjacent laminations together instead of one at a time. 1. 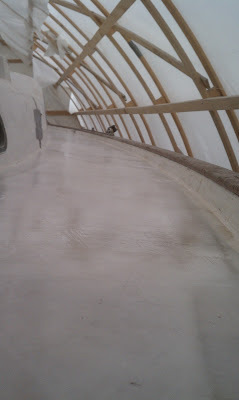 Cut and fit all the biaxial glass for each section to be laminated (50" sections). Remove and set aside. 2. Mix up 16 oz of epoxy and spread a thin coating on the deck where one of the 50" sections of glass will be laminated. 3. Set the glass in place and wet it out. 4. 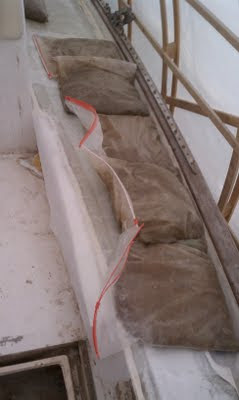 Cover section with plastic sheeting and then put sandbags on top. 5. Move to next section and repeat steps 2-4. It all seems reasonable, but when your rushing you make mistakes. The mistake I made was on step #4 of the first lamination. Nothing huge, but enough to be annoyed with myself for rushing. 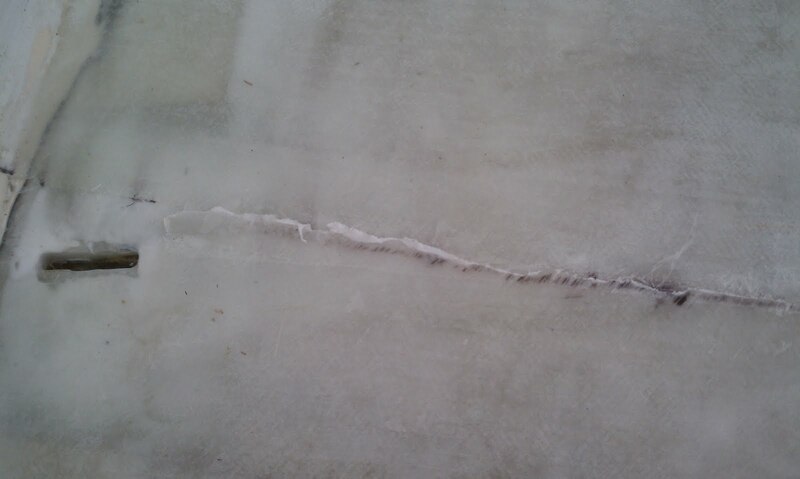 I laid down the plastic but failed to see that I overlapped about an inch of the plastic into the next lamination area. So when I moved onto the next step I set the glass in place but didn't see that there was plastic on the deck and as a result, I laminated about an inch of glass on top of sheet plastic. Ooops. I'll have to cut out that seam and redo before I fair the decks. Oh well, one more thing to do...On the bright side, the rest of the lamination looks good. Over the weekend I tackled the forward part of the decks adjacent to the cockpit and changed my technique a bit. Normally I have been pre-fairing and letting it cure before sanding it down in preparation for the top layer of glass, but I decided it mostly at the same time. 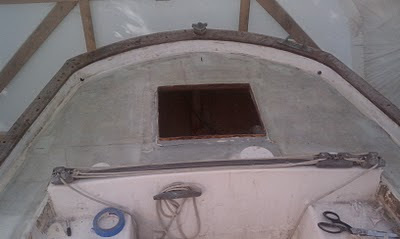 First I prepped the decks by sanding and wiping down with acetone, then I cut all the glass to fit the areas to laminate. Next I mixed up 24 oz of epoxy (thickened to mayo) and pre-faired both sides of the decks adjacent to the cockpit. I leveled it out as best I could and then let it sit for about 2 hours. That gave it enough time to harden up but it was still somewhat malleable if you worked it. After I was convinced it was hard enough to proceed, I mixed up another 24 oz of un-thickened epoxy and spread it out over the still tacky pre-faired layer. 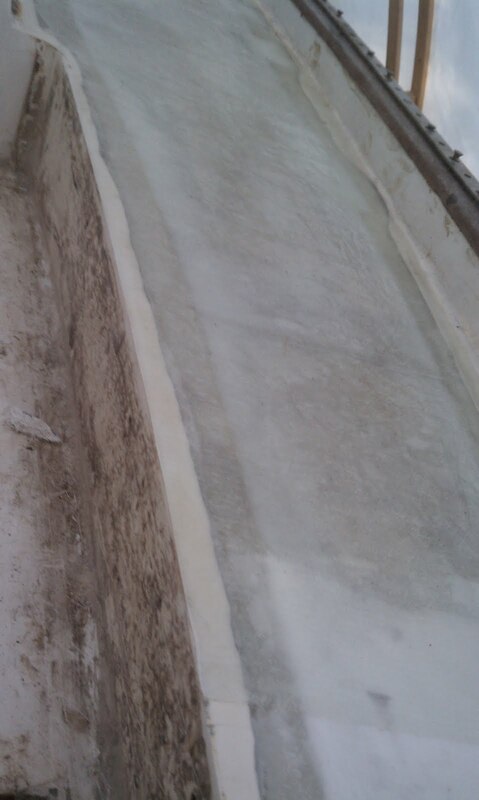 Then I laid down the cloth and wetted it out. 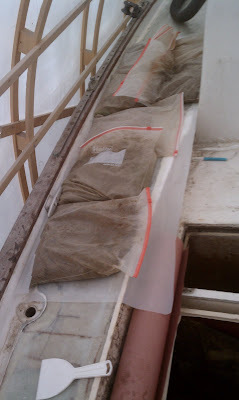 I finished up by covering with plastic and weighting down with sandbags (I was much more careful this time). 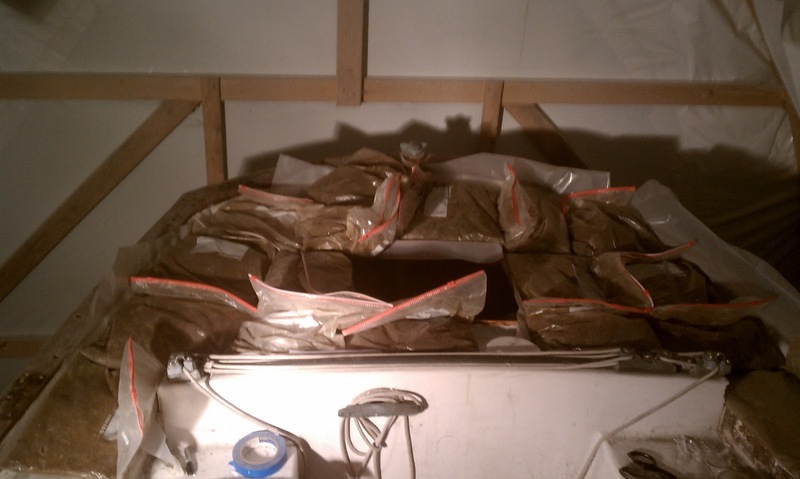 I'll post a few more pictures when I pull the sandbags off today. I hope this new (for me) technique works out; I have no desire to do any more sanding than I have to and if I can eliminate any along the way, I won't be disappointed. Well, weekend madness got in the way of a perfectly good work period, but I did manage to get the third layer laminated all the way back to the cockpit on the starboard side. Not much, but I'll take what I can get. It came out pretty well and final fairing should be minimal.